A Nasa spacecraft that will hurtle past Pluto on Tuesday at more than 45,000 kilometres per hour has revealed the dwarf planet to be larger than scientists thought. Fresh measurements from New Horizons, the first spacecraft to reach Pluto on the outer edge of the solar system, show that it is 2,370 kilometres across, roughly two-thirds the size of Earth’s moon. Alan Stern, the lead scientist on the $700m (£450m) mission, said the increased dimensions meant Pluto must hold more ice and less rock beneath its surface than researchers had expected. Other instruments onboard New Horizons confirmed that Pluto’s north pole bears an icy cap. The latest measurements beamed to Earth from the probe picked up chemical signatures of methane and nitrogen ice in the polar cap. One early image received from New Horizons last week showed Pluto as an orangey globe bearing a large bright spot shaped like a heart. More recent images have revealed cliffs, craters and chasms larger than the Grand Canyon. 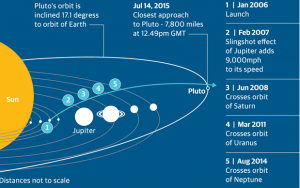 New Horizons will perform its historic flyby at 12.49pm BST on Tuesday. But scientists must wait until 2am BST on Wednesday for the probe to make contact with Earth and confirm it has survived the encounter.